Savannah here, I’m happy to announce that I will be dishing out new posts on the regular! I thought I would make my first post about something we get asked about a lot at MJV - gold plating vs gold filled vs solid gold. I hope this break down helps you when you’re shopping for your next piece and gives you a little background into the science and history. For as long as history has been written down, gold has been a commodity of enormous value and held in high regard. Wars have been fought over it, the age of exploration was driven by it, people have moved across countries in hopes to strike it big off of it, and economies have been based off of and backed by it! Am I refreshing your social studies memories of the three G’s: Gold, Glory and God? Gold plating (“GP”) could be an option for the price conscious shopper and is readily available in many stores you may frequent when shopping for your latest wardrobe. The origins of the first gold plating practice was first discovered during excavations in Peru during the 1980’s. Archaeologists discovered that the ancient smiths used copper alloys with gold which is known as tumbaga on their ceremonial pieces which date back to 50 - 300 AD! Fast forward many, many years to the early 19th century when Italian scientist by the name of Luigi Brugnatelli invented electroplating and was the first successful person to plate a thin layer of gold onto a piece of silver. Essentially, gold plating covers a base metal (brass, copper, nickel, etc.) in a thin layer of gold through electroplating. We’re talking super thin, as in 0.00023622 of an inch. The pros are the cost. The cons are the cost. Can you pick up that cute necklace for a steal? Yes! Can you sell that necklace for a good price? Nope. The gold content is almost immeasurable, meaning you couldn’t even scrap it. Another downside to gold plating is that the gold finish just won’t last; you may get a couple of wears out of it but in a short while the gold will start to rub off exposing the base metal. This is especially annoying if you have an allergy to base metals like nickel. Nothing says “cute” like a green itchy rash around your neck (I know from experience). You won’t need to worry about your allergies with gold filled jewelry (commonly referred to as “GF” or less commonly “Gold Rolled”) as GF jewelry is often guaranteed to last 30 years before beginning to wear. GF pieces have a much thicker layer of gold on them than gold plated. Gold filled pieces manufactured in the United States are legally required to contain 1/20 (5%) gold by weight. This is why you’ll see stamps on GF pieces stating “1/20 XXk GF.” Do keep in mind that not all countries conform to these same standards. It is important to note that gold filled jewelry, especially with lower carat weight (10-14k) may be more durable than a higher gold content. The higher the carat number, the softer the gold (science class refresher!). GF jewelry may be a good choice for you due to it’s more affordable pricing and longevity. Besides, since fashion is often cyclical, you may retire your GF piece for a few years until that style is in again, making it last longer than 30 years. 10k: 41.7% gold -- The minimum standard for gold in the USA. Very strong and will hold up well. 14k: 58.5% gold -- Good, pretty strong. 18k: 75.0% gold -- Good strength, good balance in purity. 24k: 99.9% gold -- The purest gold you can buy, very malleable. Each type of gold has its pros and cons, and it really depends on what you are going for: an accessory that matches your outfit for a special occasion that is affordable, or a staple piece that you can wear for the rest of your life. 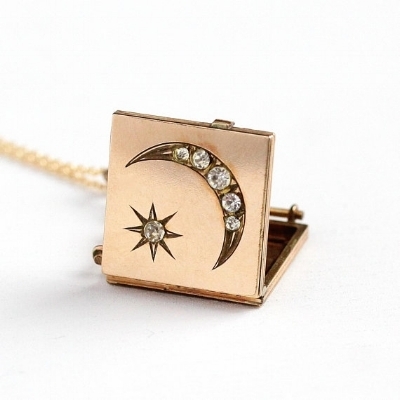 Can you tell the difference between these lockets and identify the solid gold vs gold fill Star and Moon locket? Older PostWomen's History Month - Female owned businesses we love!